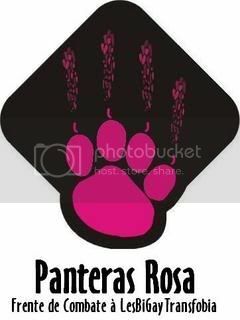 Panteras Rosa: Não à associação do Queer Lisboa com o criminoso apartheid israelita! 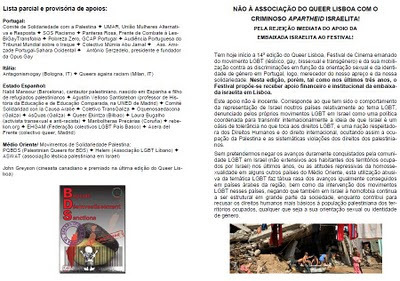 Não à associação do Queer Lisboa com o criminoso apartheid israelita! TOD@S CONTRA O APOIO DA EMBAIXADA ISRAELITA! Inicia-se na próxima 6ª feira a 14ª edição do Queer Lisboa, Festival de Cinema emanado do movimento LGBT (lésbico, gay, bissexual e transgénero) e da sua mobilização contra as discriminações em função da orientação sexual e da identidade de género em Portugal, logo, merecedor do nosso apreço e da nossa solidariedade. Nesta edição, porém, tal como nos últimos três anos e apesar de alertas que já lhe foram dirigidos no ano passado,o Festival propõe-se receber apoio financeiro e institucional da embaixada israelita em Lisboa. Este apoio não é inocente. 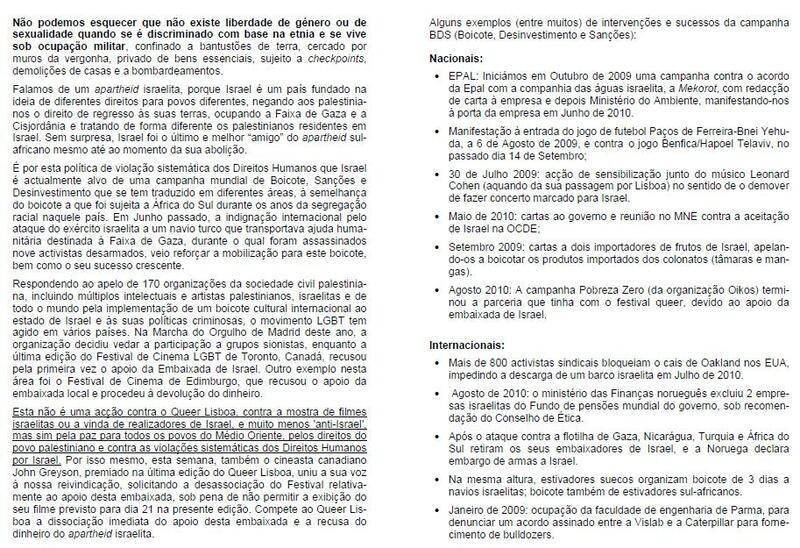 Corresponde ao que tem sido o comportamento da representação de Israel noutros países relativamente ao tema LGBT, denunciado pelos próprios movimentos LGBT em Israel como uma política coordenada para transmitir internacionalmente a ideia de que Israel é um oásis de tolerância no que toca aos direitos LGBT, e uma nação respeitadora dos Direitos Humanos e do direito internacional, ocultando assim a ocupação da Palestina e as sistemáticas violações dos direitos dos palestinianos. Pela rejeição imediata do apoio da embaixada israelita pelo Festival! 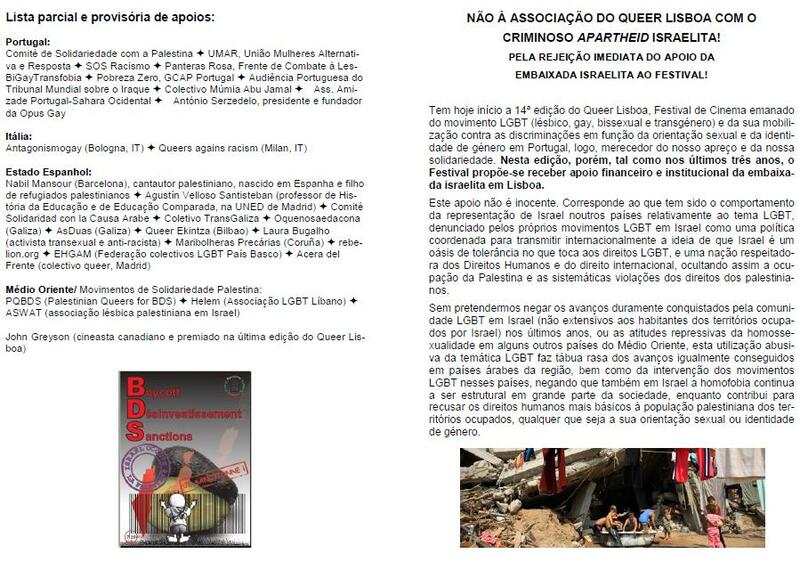 Queer Lisboa will not be associated with Israel’s criminal apartheid! We immediately reject the Israeli embassy's support of the Festival! On September 17-25 the 14th edition of Queer Lisboa will take place in the city of Lisbon. As the Cinema Festival was born from the LGBT (lesbian, gay, bisexual and transgender) movement and its mobilization against discrimination based on sexual orientation or gender identity in Portugal, it is a venue worthy of our appreciation and solidarity. Presently, however, as has been the case for the last three years, the Festival is about to receive both financial and institutional support from the Israeli embassy in Lisbon. There is no innocence in this support. It corresponds to Israel’s representation of itself to other countries regarding LGBT issues, which has been denounced by Israeli LGBT movements as a coordinated policy to project a global image of Israel as an oasis of tolerance for LGBT rights, a nation respectful of Human Rights and international law, and therefore concealing the occupation of Palestine and the systematic violations of the rights of the Palestinians. We recognize the hard-won victories of the LGBT community in Israel in recent years, as well as the deeply repressive attitudes towards homosexuality in some other countries of the Middle East. Nonetheless, Israel’s exploitative use of the LGBT campaign undermines the advances also made by LGBT activists in Arab countries and their ongoing struggle, while also denying that structural homophobia continues to exist in large parts of Israeli society and refusing the most basic human rights to the Palestinian population of the occupied territories, regardless of sexual orientation. 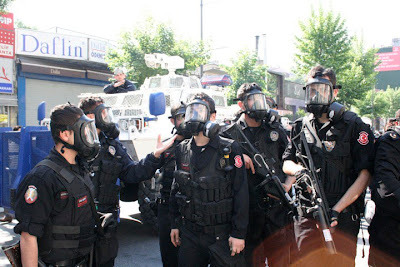 We must not forget that there can be no meaningful freedom of gender or sexuality when one is discriminated against on the basis of ethnic background, forced to live in closed bantustans under military occupation, surrounded by walls of shame, deprived of basic necessities, while subjected to military checkpoints, house demolitions and bombings. These systematic violations of Human Rights are the reason that Israel is the subject of a global campaign for Boycott, Divestment and Sanctions, similar to that imposed on apartheid-era South Africa. Last July the international community expressed indignation over the Israeli army’s attack on a Turkish ship carrying humanitarian aid for the Gaza Strip, in which nine unarmed activists were murdered; this attack reinforced the need for mobilization on the boycott campaign and to insure its growing success. The LGBT movement in several countries has now responded to the appeal made by a number of Palestinian, Israeli and worldwide intellectuals and artists for the implementation of an international cultural boycott against this state and its criminal policies. 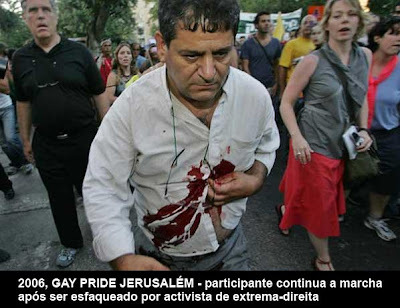 In Madrid’s Pride March this year, the organization decided to ban Israeli sponsorship, while the most recent edition of the LGBT Cinema Festival in Toronto, Canada, refused, for the first time, the support of the Israeli embassy. In another example the Cinema Festival of Edinburg refused the local embassy’s support and returned the sponsorship money. Queer Lisboa 2010 must act likewise by immediately dissociating itself from this embassy's support and immediately returning Israel’s apartheid money! "I'm writing today with grave concerns. I've just learned that your festival (which as you know, I respect immensely) has been receiving funding from your Israeli embassy for the past four years. Palestinian and Portuguese queer activists have spoken out, issuing an international call in support of the Palestinian BDS (Boycott Divestment Sanctions) campaign, asking that you refuse such sponsorship. I was greatly honoured when my film Fig Trees was awarded your best documentary prize last year. I was greatly honoured when you chose to program my film Covered in your festival this year. However, I can't in good conscience be part of any festival that actively helps pinkwash the current Israeli state. 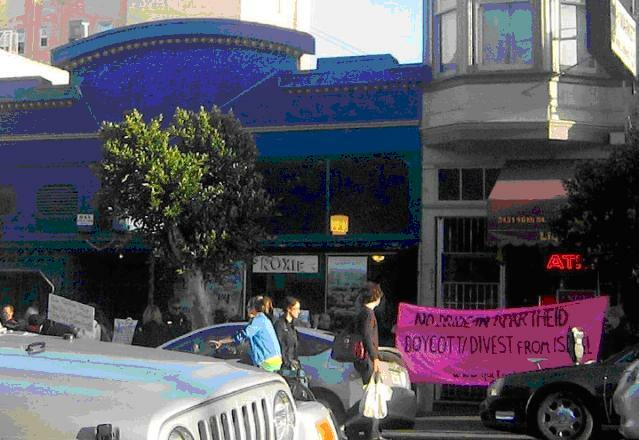 In the wake of the Gaza war, the flotilla massacre, and this weeks statements by Netanyahu regarding the extension of illegal settlements, I strongly feel that we queer filmmakers (and queer festivals) must stand together and heed the call of our queer sisters and brothers in Palestine, protesting the violence of the occupation that hurts everyone, gay and straight alike. Could you please clarify what funding you receive/have received from the Israeli Embassy in these past four years? 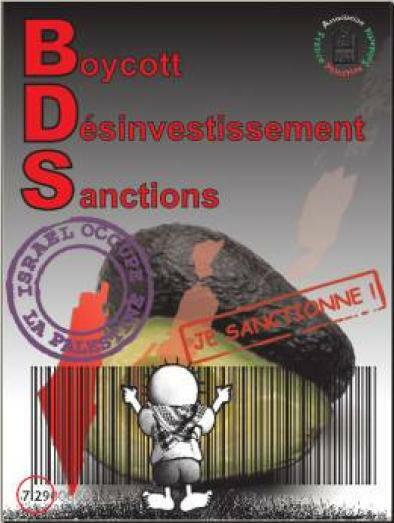 And... if there is funding this year, I respectfully ask that you refuse it, in honour of the international boycott call, now five years old. If you go forward with such sponsorship, I can't in good conscience be part of your festival -- a decision that would deeply sadden me, given the tremendous support you've shown my work in past years. Your programming past and present speaks to your enlightened vision of queer cinema, one that celebrates our diverse voices, global struggles and activist aspirations. Join Toronto, join Madrid, join a growing peaceful boycott movement that could help bring lasting peace to the region. It's time to heed the call. - Denúncia do 'pinkwashing' pelo movimento LGBT israelita:Israeli GLBT Politics between Queerness and Homonationalism, por Aeyal Gross, académico e activista queer.